Do I Need a Commercial Fence for my Business? At Future Outdoors, we know that vinyl fence is ideal for residential properties. But what about vinyl for commercial fencing? There are several reasons why business owners should consider a vinyl fence for their commercial fencing project in Dallas. Fences are important for businesses in many ways. If you aren’t sure whether your business needs a fence, read over the benefits of commercial fencing below to see if you could take advantage of one. The chief function of most commercial fences is to increase security. Even a standard 6-foot fence can help prevent theft and intruders. Along with security, a quality fence allows you to control access to your property. Want to make sure your parking lot or entrance is only accessible from one place? A commercial fence can provide that benefit. If your business is part of a complex or in a busy area, a commercial fence can provide you with privacy and visual control. It can also segment areas such as dumpsters and delivery docks, shielding them from view. Even if your business doesn’t need a security fence, you might benefit from a commercial fence for appearance alone. Many businesses look great with a picket or ranch-rail fence outside. One of the best characteristics of vinyl is its lifespan. Unlike a wooden fence, vinyl will not rot or warp over time. And unlike a steel or chain-link fence, it won’t rust or break down. Vinyl is the perfect long-lasting commercial fence solution. Vinyl’s lifespan isn’t its only benefit. Vinyl is also tougher and more durable than other types of fence. Vinyl fences stand up to impacts and weather better than wooden or steel fences. Because they’re made of modular components, they’re also easier to repair in the event of any damage. Most wooden fences need repainted or restained once a year. Chain-link fences need regular applications of paint or sealant to prevent rust and staining. In contrast, a vinyl fence needs almost no regular maintenance at all. 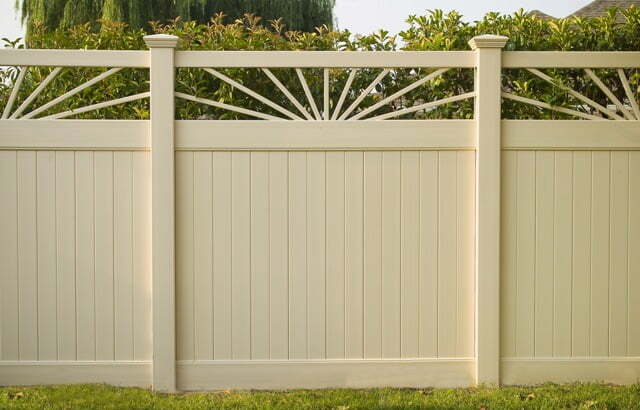 There is no need to repaint, stain, seal, or coat a vinyl fence. The only maintenance a vinyl fence needs is a quick spray with a garden hose when it’s dirty. Other than that, it will stand strong and look great year after year. Not all businesses look the same. If you want to create a unique impression, or you just want to match your building, vinyl is the right choice. Vinyl fence comes in a wide variety of colors and styles to match any exterior. You can even order a vinyl fence that looks like wood, giving you the benefits of wood’s classic style without any of the drawbacks. You can also choose a variety of accents and accessories to make the look complete and unique. Looking for a tall security fence? Vinyl privacy fences are available in heights up to 8 feet for high security, and custom fence panels are also available. We’ve built fences that are 12 feet high for customers who require the highest security. Want your fence to be more for appearance than security? Consider a vinyl ranch-rail or vinyl picket fence. We understand that every business has different needs for their fence. A vinyl fence can be the perfect way to meet those needs without compromising on appearance or value. The best characteristic of vinyl fence is its value. With other types of fence you’ll need to factor in the costs of repairs, maintenance, and eventual replacement. These costs affect your bottom line. With a vinyl fence, the only cost is the one you pay up front. Over time, you’ll pay far less for a vinyl fence than you will with any other fencing material. Want to learn more about getting a vinyl fence for your Dallas business? Contact us today at Future Outdoors. We’re the number one installer of vinyl fences and vinyl accessories in Dallas. Call 972-576-1600 to speak to one of our vinyl fence experts, or visit us on Facebook to get more helpful advice and tips for your business or home.